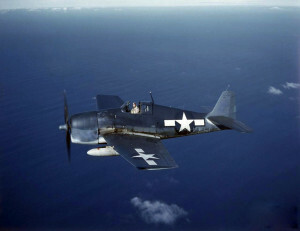 On November 27, 1943, Ensign Paul M. Churton took off from Quonset Point Naval Air Station in an F6F-3 Hellcat, (Bu. No. 65925), for a routine training flight. Approximately two minutes into the flight the aircraft motor started cutting out and then stopped altogether, forcing Churton to make an emergency landing in Narragansett Bay. Ensign Churton escaped from the aircraft uninjured. Investigation revealed that the same aircraft had been grounded three times by three different pilots the previous day for the same problem, and each time it had been placed back in service by the mechanics. After examining the recovered aircraft, a crack was found in the engine which had allowed foreign matter to impede fuel and oil flow. Ensign Churton was assigned to VF-14.